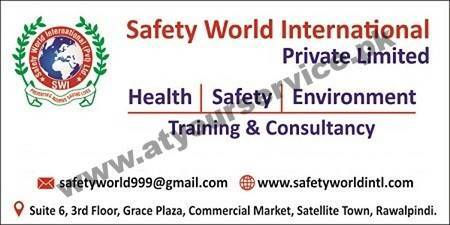 Safety World International is located in Grace Plaza, Commercial Market, Satellite Town, Rawalpindi. Safety World International provides Occupational Health and Safety Training and Other Service to all types of industries. Safety World International renders a Skill Developmental Service that will improve your employee’s skills and promote safe working practices within working environments.